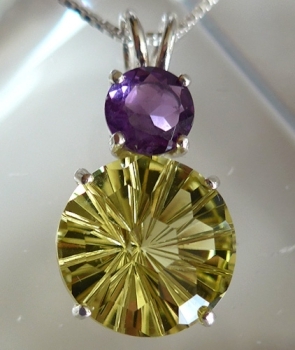 This remarkable pendant combines two spectacular cuts. On the back of the clear quartz gemstone is a modified Millennium Cut, a starburst pattern that was created in the early years of the 21st Century by master jewelers to reflect the emerging consciousness of a new millennium. The surface of the Super Nova is laced with an intricate pattern of flat hexagons, like a honeycomb or the eye of a honeybee. The honeycomb is also composed of hexagonal cells. This unique cut is said to help the bearer to bring to consciousness all the information that is normally held subliminally, in the unconscious mind, or which is in the periphery of consciousness and awareness. This honeycomb cut pendant can help to render the bearer much more acutely perceptive, and to enhance the critical spiritual faculty of discernment, which is so vital to us all in today's rapidly changing, tumultuous global environment.